Donald E. Gray | Shifting the Burden – Whose Monkey is it? “Don, the software’s locked up again! Can you come up here tomorrow and fix it?” George was on the other end of the conversation. George and I had started working together when his employer moved a production line from Florida to Virginia. This move created all sorts of problems1. The daily struggles getting the hardware, software and process playing nicely together had become a weekly check-in with an occasional on-site visit. This made the request seem a little odd. Taking a deep breath allowed me to work through some quick thoughts2. The software was running on 15 different computers. There wasn’t any way they could all lock up at the same time. And what does “lock up” mean anyway? What’s going to happen different between now and tomorrow, or now and next Monday? And if I drop what I’m currently working on to rush up there tomorrow, am I really helping George? What long-term consequences result from this? The more the computer locks up, the more Don gets called. The more Don gets called, the more problems he solves. 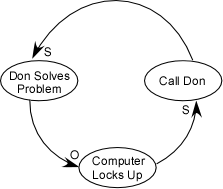 The more problems Don solves, the less the computer locks up. This is a balancing loop that brings stability to George’s process. It’s also a symptomatic solution, a quick fix to make the pain go away. But following the steps in B1 only solves the immediate problem; it does not solve the underlying fundamental problem. Think of it as treating the symptom, not the disease. 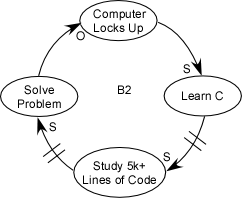 Since B1 and B2 both contain “Computer Locks Up” we can combine the two causal loop diagrams into a more complete problem-solving picture. 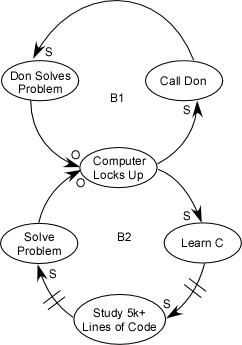 This shows the how the event “Computer Locks Up” can trigger one of two responses: a symptomatic response to make the problem go away quickly (B1), or a systemic response (B2) where the system becomes more capable of solving problems without external influence. This pattern occurs often enough that systems people have given it a name, “Shifting the Burden”. I’d been aware of this archetype, but preparing for my “Déjà vu” session3 with Diane Gibson sharpened my awareness of what could go wrong. There happens to be a long term reinforcing loop that can show up with this archetype. This occurs when the symptomatic solution (B1) gets all the action. Don becomes better at both “C” and knowing the code base. 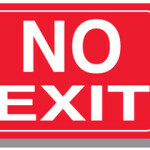 This makes it easier and quicker for Don to solve the problems, and Don becomes indispensable. This means the system’s ability to “cure itself” becomes atrophied. George loses his ability to persuade management to give him training. Production becomes accustomed to “great customer service” from Don. The ability to tolerate “pain” goes away, and the quick fix becomes the only fix. Invoking the symptomatic solution not only starts B1, it initiates R3. 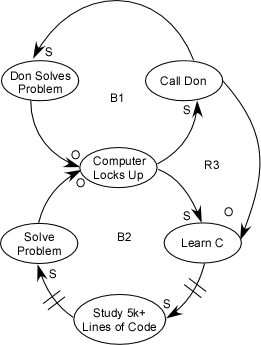 Calling Don reduces the need to learn “C”, thereby weakening the system’s problem solving ability. Carried to the extreme, this becomes an addictive response, and cripples the system. Either balancing loop can be chosen to a given problem occurrence. Handled properly B1 can be used to alleviate acute problems, while invoking B2 to solve chronic problems. This pattern of selectively, consciously choosing how to deal with each problem has resulted in George’s ability to solve more code problems and start making enhancements to the code base. 2 Don’t Just Do Something, Stand There!